The Lipstick is called "Liar" & It's a gorgeous pastel pink, very opaque but is one of a few with tiny shimmery particles in it rather than being matte. Holly tried this one on & we both fell in love with it. 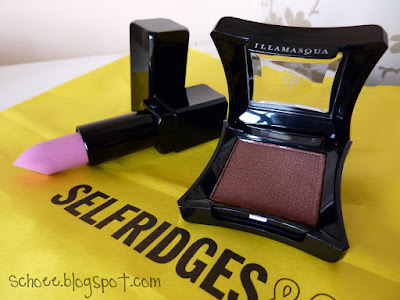 I cannot wait to wear this, I really love Illamasqua lipsticks, the lasting power is seriously good. The other one i purchased (Obey) i wore in my latest FOTN, and i had to scrub it off my lips before bed..AND in the morning. I was thouroughly impressed. Im not too sure if the shimmery ones will have the same effect but we shall soon see. 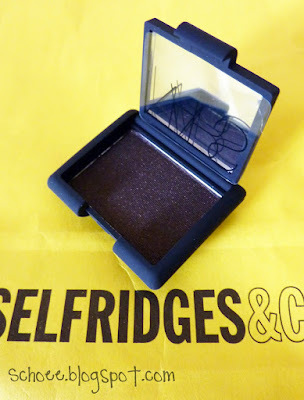 The eyeshadow is called Tango..and again, among all the hundreds of mattes they have, is a shimmer. I love my shimmers clearly. It's a gorgeous reddy brown, and i actually dont think i own anything like it. I have browns, but none with a red/orange undertone. Next was the Nars counter. I don't know if you've had a chance to look at the new collection but there are a few gems in there. It's called Mekong, and it a deep brown, with tiny gold specks. It looks a little purpley in the photos, i don't know why but it's not showing it in all it's beauty. I was trying so hard to get it to show up the right colour...dang! They are by far the most pigmented shadows i have ever used. one swipe and it's there in all it's glory. I swiped this on my hand the other day (before urchasing) and even after i'd scrubbed at my hand, there was still a little mark there at the end of the day. 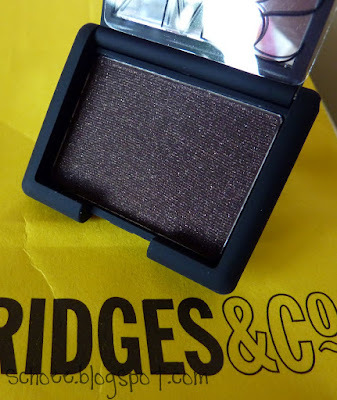 I havent used many of the lighter Nars shadow shades, so i cant say whether they are as pigmented as the darker ones, but from swatching at the counter many times before, i have never been dissapointed. Look out for these products in some FOTD's in upcoming posts. These are all far too pretty to let them go un-demonstrated. Anything else in this Nars Collection you think is worth the buck? I loved the look of the duo..but one shadow was very glittery (of the chunky nature). & theres a palette i have my beady little eye on.